Welcome to Count Dracula's lavishly luxurious lair, where monsters of all kinds party the night away. 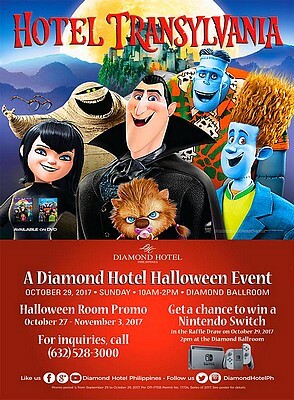 Diamond Hotel's Halloween event includes these activities for kids: Trick or Treat around the hotel, face painting, glitter tattoo, arts and crafts, photo booth, musical performances, and food and beverage selling stations. You can also get a chance to win exciting prizes, including a Nintendo Switch with Gray Joy-Con raffle prize! Make it an even more fun weekend by taking advantage of the Halloween Room Promo. With rates starting at P5,800 net, enjoy buffet breakfast for two, one free ticket for the Trick-or-Treat event on October 29, 20% off on massage and laundry, and other standard amenities.